Guitarist George Freeman is a weirdo. I’m not referring to his personal life, just his guitar playing. It’s that weirdo element, along with some heavy swing, a big dose of the blues, and some genuine funk that make his playing what it is. But, even that’s not the weird part. It’s his idiosyncratic phrasing and note choices that smack of free jazz. It is those bumble bee like streams of notes, that frantically dart in and out, more like a saxophone than a guitar. It’s that chromaticism and subtle dissonance, mixed with a deep, but non-traditional blues sensibility. Put it all together and it is weirdly right, not quite crude, but almost, while also being genuinely sophisticated. It reminds me of Robert Pete William’s blues. Never will you hear 12 bars or traditional call and response, but you still hear pure blues, when you listen to Robert Pete. That is George Freeman’s jazz, inner city, bar band, and soul infested jazz, sitting just far enough outside to belong everywhere and nowhere in particular. George Freeman comes from a family of exceptional jazz musicians; tenor sax men Von Freeman (George’s brother) and Chico Freeman (George’s nephew) are similar to George, in that they are not quite like anyone else in their chosen idioms. Listen as Von takes it way outside on the old chestnut “My Ship,” from George’s classic 1969 album “Birth Sign.” You’re almost unaware that you’re traveling at the outer reaches of the musical language because he swings and plays with so much grit that he seems to be honking a straight-up funky blues. His feel causes you to hear the music differently, so you accept the dissonances without thinking of them as dissonant. There are emotional and intellectual layers to his playing, making it a multi-dimensional experience that gets’ deeper with every listen. Von is a legend in jazz circles, especially in the Windy City, where he’s played with everybody from Charlie Parker and Dizzy Gillespie to Sun Ra and blues legend Jimmy Witherspoon. Chico Freeman, Von Freeman’s son, is much the same, playing straight ahead jazz with people like Cecil McBee and blues with the pre-war blues master, the late Memphis Slim. He’s also played with R&B diva Chaka Khan and the Latin Jazz legend Tito Puente. George is probably the least known of the three and is solely his own man when it comes to the world of jazz guitar. His resume of musical associations is an extraordinary list of pre and post-war jazz legends; Lester Young, Charlie Parker, Richard “Groove” Holmes, Ben Webster, Illinois Jacquet and Les McCann to name a few. As a solo artist he had a funk hit with the underground classic “The Bump” in the 1970s. I would assume that rappers and some acid jazz artists have sampled his work, especially “The Bump.” But, admittedly, I haven’t heard it. If not, Freeman’s work should be a goldmine of possibilities. As far are as recent output, a couple of recordings have turned up. One with his nephew Chico was released a few years back. Beyond that, however, little music has seen the light of day over the last thirty years or so. 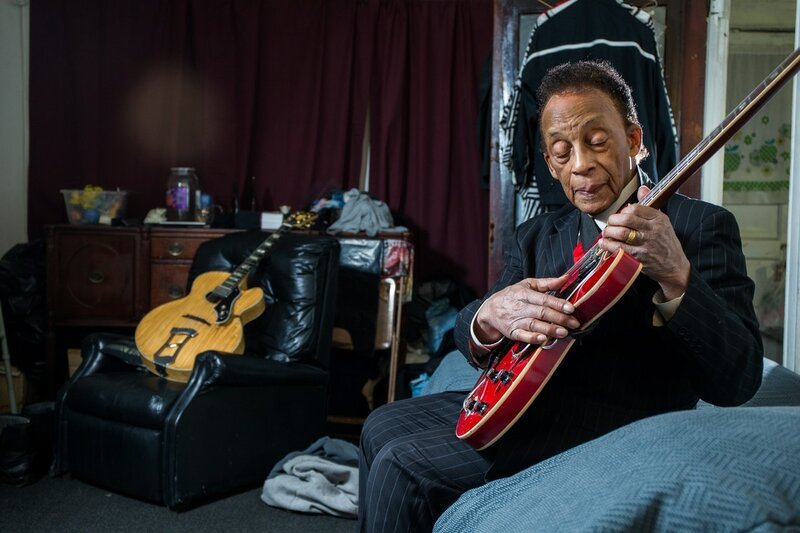 George Freeman appears to emerge now and again when it suits him, and then he slips back into his private life and the underworld of the Chicago jazz scene, leaving barely a ripple. Likewise, outside of the occasional Chicago newspaper article or magazine piece, there is virtually nothing about the man or his music on the web. Even Wikipedia’s section on Freeman is a perfunctory list of musical affiliations, which is unfortunate for an artist of Freeman’s originality. find--from this nearly 90 year old living legend--should make that abundantly clear.